I’ve often wondered what my last meal on earth would be. When posed with this question people usually want comfort food: pizza, burgers, lasagna, ice cream and pie. I always thought pizza and ice cream would be my choice. After my meal at Imperial, I vote for Doug’s Fried Chicken! Doug Adams came up 3rd place in the most recent Top Chef season. He’s from Texas but moved to Portland and has been bouncing around at various impressive Portland restaurants before become Sous Chef at Imperial under Vitaly Paley. 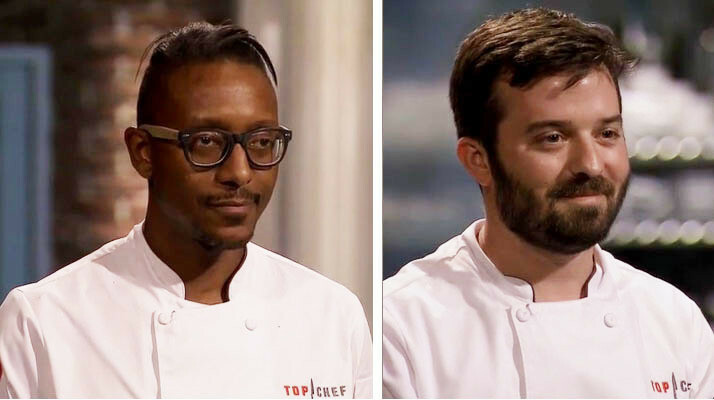 This season of Top Chef was pretty good and from the start I was hoping Gregory would win. 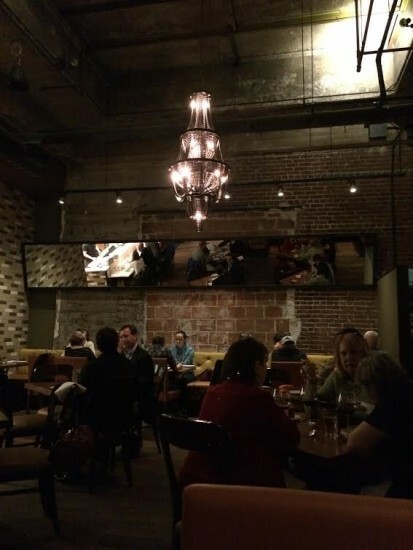 He’s another Portland chef at Departure (a great place!). In the end it came down to Gregory, Mai and Doug. I was bummed when Melissa left. I felt like she was better than Mai, who ended up winning. I thought Melissa’s dishes looked the best and she had a nice personality–Mai not so much. I was SO BUMMER when Gregory didn’t win. Loved him. 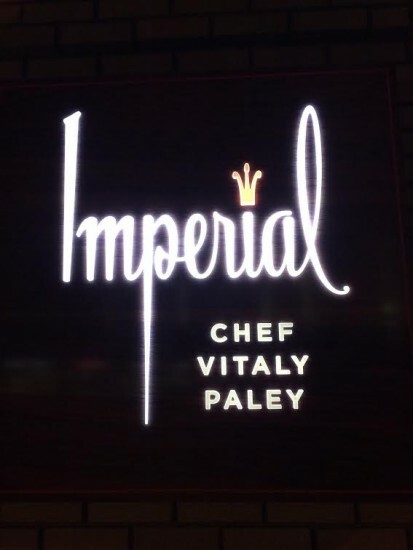 Michael has been raving about Imperial for ages now and this was the first time I’ve been. Now I’m kicking myself for not going before all the Top Chef groupies. 🙂 What a cool place! It’s in the Hotel Lucia and the decor is modern and chic, the whole vibe is really cool. I wasn’t sure what to order. Everything sounded so intriguing! 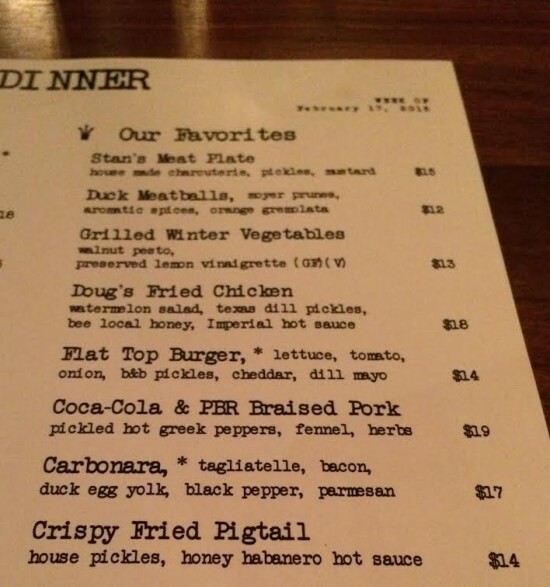 Even the Crispy Fried Pigtail….! I had my eye on the sausage du jour until I found out it was Blood Sausage (no thanks). In the end all three of us ordered the Doug’s Fried Chicken. We shared an order of the fries (I ate more than I planned on but not so many that I regretted it). Michael’s dad said they were the best fries he’s ever had. 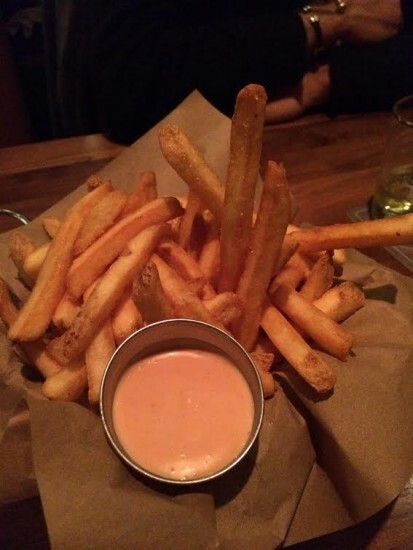 I thought they were pretty darn close (nothing compares to duck fat fries). 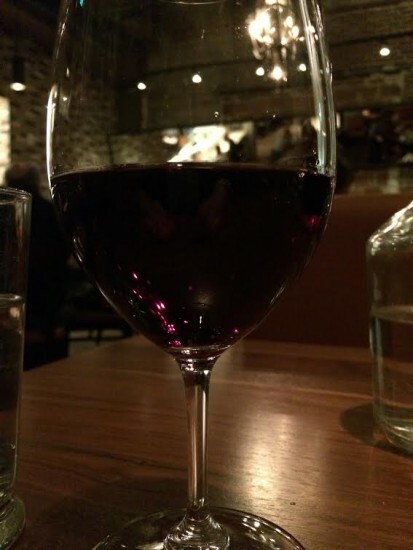 I got a glass of a Pinot Gris that was way too sour for my liking (it was like eating a lemon) and ended up getting a lovely glass of Cab Franc (which I rarely drink but LOVED so will have to look for it elsewhere). This was kind of my last meal. After a weekend of indulging when Michael’s dad was visiting, it was the last decadent meal before I was getting back on track! Michael ordered a salad and I had a few bites. It was the “Winter Citrus Salad”. It was salad greens, pistachios, grilled onions, tomatoes, grapefruit slices and an Oregon black truffle vinaigrette with the black truffle shavings on top. Holy COW. BEST SALAD EVER. I’ve never had a salad this good. I had two bites and wished I’d ordered my own. It was incredible. Absolutely, hands-down, incredible. And it was just a salad! 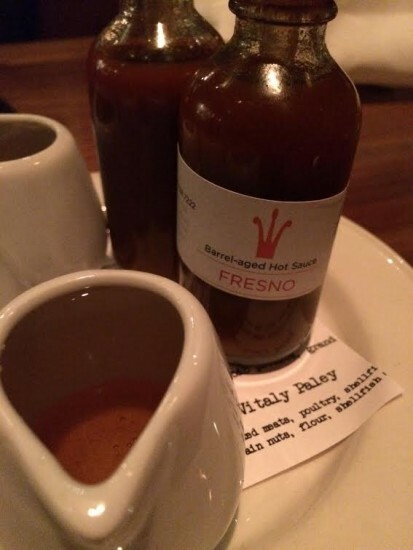 The waiter brought out the housemade hot sauce that was in an old-fashioned eye-dropper bottle and honey. Apparently they have beehives on the roof and make their own honey! So Portland. It was amazing, though. The place was so packed and service was slow, but that was expected. I figured it was the new-found celebrity. The waiter was great though and checked in frequently. 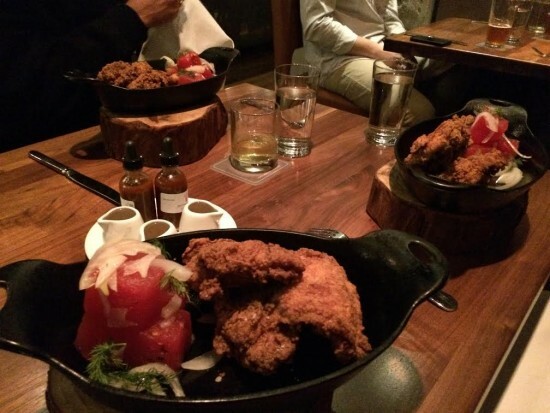 The fried chicken came out on cast iron skillets atop tree stump trays. 🙂 Again, totally Portland. But the presentation was incredible. 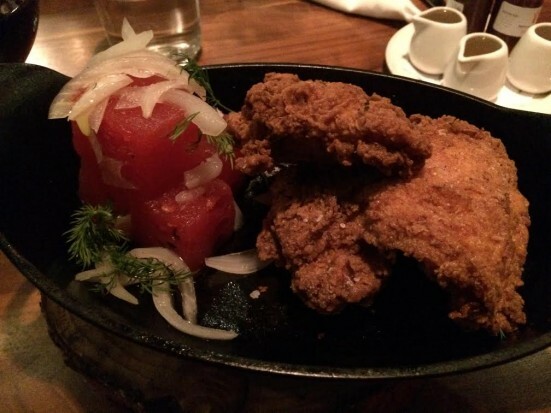 Two large pieces of fried chicken with a watermelon salad on the side. Sounds simple but it was so fantastic. The watermelon was perfect, which was weird because it’s off season. 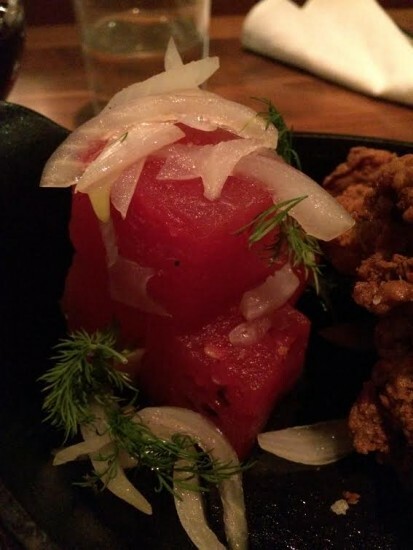 The watermelon chunks had pickled onions, fennel and a tart vinaigrette on it. It went perfectly with the chicken. The watermelon was so juicy. How was the chicken? It was pretty darn good. Most importantly: Michael’s dad said it was the best meal he’d ever had and wants to come back to Imperial every time he visits. 🙂 I loved the chicken. The hot sauce could have been a little spicier for my tastes, but other than that everything was great. I loved drizzling honey on top of the fried chicken. I’d never thought of that before. So smart! Somehow we got talked into dessert. I have no idea how because we were all stuffed and certainly didn’t need anymore food. It was the last dessert and we snagged it. It had been popular that night! We got the “Texas Sheetcake”. 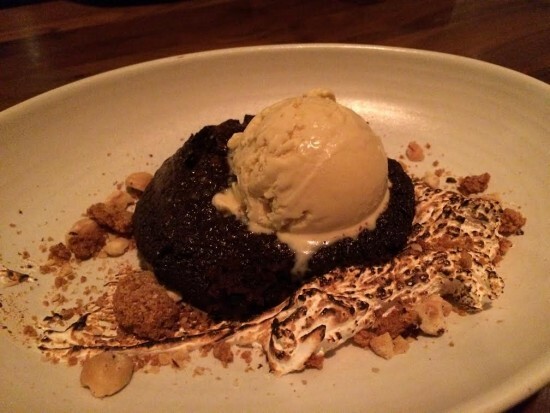 It was warm, gooey chocolate cake topped with honey ice cream (which I thought was pecan at first) hazelnuts and toasted marshmallow. IT WAS AMAZING. OMG. Thankfully we split it because it was so rich but seriously, I could have eaten that whole thing on my own. Wow. No words. So good. Sadly, we did not spot Doug in the kitchen. Maybe someday. 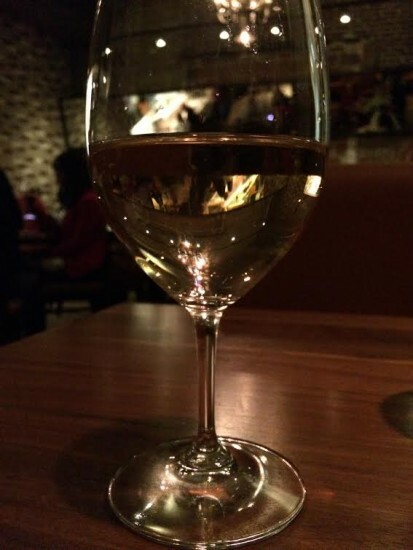 Everything tasted amazing and the service was fantastic. It was a good night all around. Yes I overdid it. I knew I was as I was partaking. This was most definitely my last meal. 🙂 Now it’s back to eating like normal–but man oh man, what memorable food! That looks wonderful! I figured that with a “celebrity” chef, prices would have been much more expensive. It wasn’t too bad! I think the most expensive item was the fancy scotch Michael’s dad got. Everything else was just average priced. “Yes I overdid it. ” …atta girl! Occasions such as this call for stomach-wisdom such as that. I’ve been back on track since though! Sounds awesome!! I didn’t realize that Gregory and Doug were both in Portland – love Top Chef but don’t always get where they are from (unless it’s Texas!!)! Yep both were from Portland at really popular restaurants! I love me some Abominable. 🙂 The bottle is adorable too (I think monsters are cute, lol). Amanda recently posted..City. Mountain. Ocean. It was a really good beer! I would have it again and agree, the bottle was super cute.